It’s been a long day of work, so you’re stoked about heading home to relax and unwind. You open the door to your car, place the key in the ignition, and then the unexpected happens – the car won’t start, due to a dead battery caused by accidentally leaving on the headlights. Sure, you can call for help, or maybe find a bystander with some jumper cables to help you out, but either way, that’s time involved that could’ve been used to get to your destination quicker. Now, if you’ve ever been in this particular predicament, the folks over at Cyntur have an invaluable accessory that you might find useful for this particular scenario. We’re talking about the Cyntur JumperPack mini, a 12,000 mAh lithium-ion battery pack that will not only charge your mobile devices, but even offer a serious jump start to your car. In fact, it’s powerful enough to jump start vehicles with up to 8 cylinder engines! 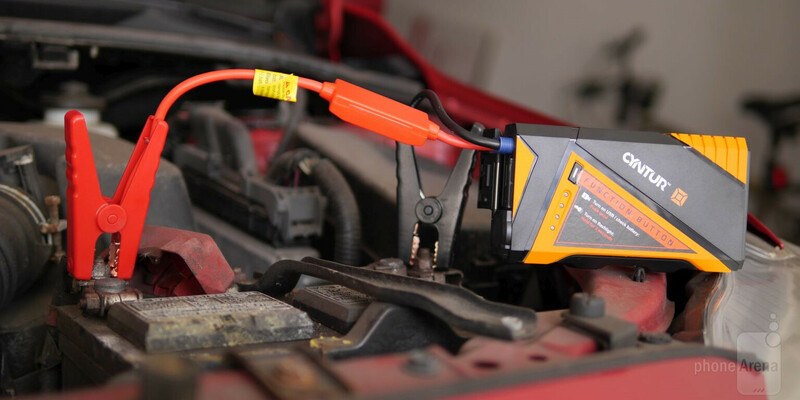 The process is pretty simple, as it involves connecting the included jump start cable to the unit – while the clamps are placed appropriately in the correct terminals of your vehicle’s battery. From there, all that’s left to do is start your vehicle, and voila! Your car is back to its working self! Honestly, the Cyntur JumperPack mini offers peace of mind in this scenario. Better yet, the company claims that JumperPack mini can retain its charge for up to a year. That’s quite generous, especially if it’s something you’ll pack in the glove box compartment, but who knows if it’ll really keep that charge for that amount of time. Nevertheless, the carrying case included with the unit keeps everything organized and within reach. Besides jump starting, we can connect a variety of devices to the 2.1A USB port on the unit to juice them up on the go. Adding more to its arsenal, the JumperPack mini also houses a 200 lumens LED light to act as a torch or emergency strobe light. In terms of design, there’s definitely a rugged quality to it, as the tough plastic exterior, with its standout orange-black color scheme, is fashioned to be IPX3 certified to protect it from water splashes. Weighing in at 1 pound, it’s pretty remarkable that it’s able to carry on a beefy 12,000 mAh battery – while also offering its jump starting abilities. Some folks might be disappointed by the single USB port on the JumperPack mini, which means that only a single device can be charged at any given time, but in all fairness, we’re forgiving because of the added functionality it boasts over other battery charging packs. Sporting a price tag of $99.99, it’s definitely a pricey investment, seeing that similar capacity battery chargers can be snagged for easily half as much online. Still, we have to mention that this offers added functionality we don’t get from those other, standard battery chargers. In those times when you need to jump start your car, the Cyntur JumperPack mini is a handy accessory to have – just because you’ll be able to drive home in no time at all. "while the clamps are placed appropriately in the correct terminals of your vehicle’s battery." LOL. Approximately.. "IN" the correct terminals? It's good to know I don't have to have the clamps ON the correct terminals, just nearby! Who proof reads this material? ?